If you’re moving to London with a pet, I’m just finishing up my three-part series on owning a dog in London. I myself am not a pet owner, but my friends are, so one of them has so graciously shared her experiences as an American expat living in London with a dog. Man’s best friend is sometimes also an expat, so here’s more information on how your pooch can smoothly transition after an international relocation. Let’s talk SHOPPING! Do you have any recommendations on where to buy pet food in London? Harrods has a brand new pet spa on their fourth floor that is truly unbelievable and will pretty much do anything for your dog. From massage to treadmill workouts to grooming, this is the place where doggy divas get beautified. Our dog prefers a more “understated” environment for his pampering, so we have not become regulars at the Harrods dog spa, but it must be seen to be believed! Now that we’ve walked the walk, let’s talk the talk. I regularly blog about “British English” to help other expats speak like a local. Is there any London lingo that an expat pet owner should likewise know? “Walkies” = Walk: People are not being silly when they say it’s “time for walkies.” It is an accepted part of dog vernacular here! “Stroke” = Pet: Children always ask if they can “stroke my dog,” and it has caught me off guard a couple of times. They are simply asking if the dog can have a little pat. “Bickies” = Biscuit: Our dog knows the word “cookie” by heart and goes crazy whenever he hears it. Apparently, the British equivalent is “bickies” (short for biscuit), and while he hasn’t quite figured it out yet, I am sure he will be in the know shortly. “Sausage” = This term of endearment simply means nothing more than “love” and is often used in the phrase “my little sausage.” It has become a personal favorite and makes me laugh! SO cute! 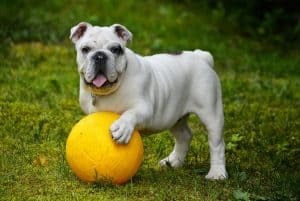 Before we wrap up here, is there anything else an expat relocating to London with a pet should know? I think the UK is about to—if it has not already—lift the quarantine on pets coming from the US to three months rather than six months, which is great news if so. The DEFRA website should have all the info a pet owner needs for bringing an animal into the country. Also, it’s possible to make a difference with your dog in London! Last year, I did a fundraising walk with ours. We raised money for the walk, which went to Dogs Trust—a lovely organization that shelters and rehomes abandoned or abused dogs in Britain—and then showed up on a Saturday for a 10K walk with other people and their pets. Having my dog in England has added to my experience here considerably. Life without a member of the family just isn’t quite the same, and with all the fun things there are to do here for people and their pets, it would be crazy not to consider it. And we have nothing but good things to say about how the Brits have treated our dog during his expat time in the UK! Awww…quite an endearing interview, don’t you think? Gobs of thanks to my dog-owning friend for contributing this canine commentary. And if you still have more questions related to a pet relocation (e.g., transport, finding London apartments that accept pets, etc. ), please do contact our London Relocation agents for advice prior to your London move.